The RoboTrex 52 automatic handling system operates the machining centre from an automation trolley, which serves as a storage medium for the vices. Depending on the part size, the trolley can store up to 42 vices. RoboTrex 52 is optionally available with up to four trolleys, which means that the storage capacity can be increased to up to 168 vices. The heart of the system is the patented vertical positioning of the vices: it ensures maximum space utilisation and guarantees best accessibility. The external pre-loading of the automation trolleys allows RoboTrex 52 Automation to be re-equipped within seconds. This ensures that no unnecessary downtimes of the machining center are caused. the Quick-Point 96 zero-point clamping system and can handle bigger vices with a clamping range of 210 mm and a width of 125 mm. By default two automation trolleys are available. A 15 trolley and a 16 trolley version with max. workpiece sizes of 205 x 205 x 90 mm and 205 x 150 x 150 mm respectively. 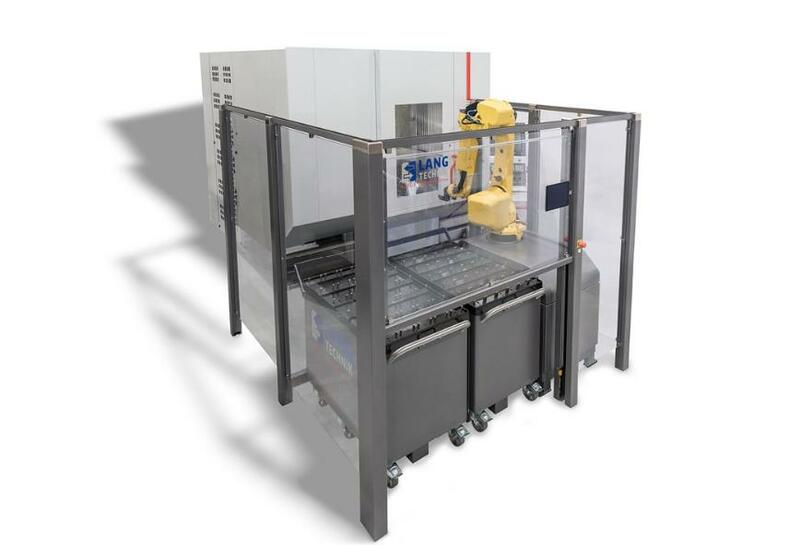 The RoboTrex 96 automation system uses the standard industrial robot M-710iC/50 from Fanuc with a maximum load of 50 kg. When a Makro•Grip® 5-Axis Vice is used, the maximum total workpiece weight is 30 kg. Optionally the system can be equipped with a stronger robot that can handle workpieces up to 50 kg.